Nose - Polyp, Inflammatory in a male B6C3F1/N mouse from a chronic study. 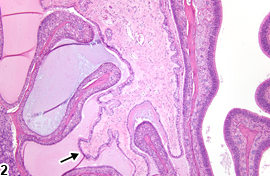 The attachment of the epithelial-lined, proliferative, connective tissue polyp (arrow) to the mucosa is not present in this section. 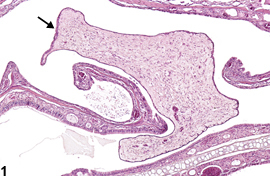 Nose - Polyp, Inflammatory in a male B6C3F1/N mouse from a chronic study. A large irregularly shaped mass of connective tissue lined by epithelium (arrow) occupies a large portion of the nasal cavity, and the adjacent nasal lumen is filled with proteinaceous fluid. An inflammatory polyp is a projection of proliferative, mature, nonneoplastic, fibrous connective tissue into the nasal lumen ( Figure 1 and Figure 2 ). It is typically infiltrated by variable numbers of mixed inflammatory cells and covered with a well-differentiated cuboidal or columnar epithelium. Inflammatory polyps have been associated with chronic irritation, such as that associated with dental dysplasia or caused by test article exposure. Inflammatory polyps should be diagnosed whenever present. Inflammation and other changes in adjacent tissues should be diagnosed separately. Losco PE. 1995. Dental dysplasia in rats and mice. Toxicol Pathol 23:677-688. National Toxicology Program. 1997. NTP TR-456. Toxicology and Carcinogenesis Studies of 1,2-Dihydro-2,2,4-trimethylquinoline (CAS No. 147-47-7) in F344/N Rats and B6C3F1 Mice (Dermal Studies) and the Dermal Initiation/Promotion Study in Female Sencar Mice. NTP, Research Triangle Park, NC. National Toxicology Program. 2010. NTP TR-554. Toxicology and Carcinogenesis Studies of 5-(Hydroxymethyl)-2-furfural (CAS No. 67-47-0) in F344/N Rats and B6C3F1 Mice (Gavage Studies). NTP, Research Triangle Park, NC. Renne R, Brix A, Harkema J, Kittel B, Lewis D, March T, Nagano K, Pino M, Rittinghausen S, Rosenbruch M, Tellier P, Wohrmann T. 2009. Proliferative and nonproliferative lesions of the rat and mouse respiratory tract. Toxicol Pathol 37(7 suppl):5S-73S.